After my last article I promised to give you some thoughts from Julian Shrago, the head brewer at Beachwood BBQ and Brewing, about adjuncts and the use of adjuncts in beer. I have to say, it was a great conversation and it was great to dive into this with someone who has such a deep knowledge of the subject. If you didn’t catch my last article, adjuncts are generally considered to be anything you put into a beer that is not grain (normally barley), hops, yeast or water. It stems from an old German beer purity law called the Reinheitsgebot. I think that adjuncts can be seen as this, “dirty”, word in the world of brewing, but Julian has his own thoughts on the subject. I hope you enjoy this edition of Al the Brewer, and my chat with Julian. Just so our readers know, how did you get into brewing and become the brewer at Beachwood BBQ? My first experience with brewing was as a home brewer, about 16 years ago. During college my parents bought me a home brew kit as a holiday gift and it was something I did on and off for a number of years, but I kinda developed a passion for home brewing in 2004 when I bought a house. Then I had room to kinda buy new equipment and kinda dive into the hobby, so it really was in 2004 that I really got into brewing. As far as getting hooked up with Beachwood, I would say, back in 2006 at the time I had become kinda discontented with my day job as an engineer, so I really thought about opening a production brewery at the time, drafted a business plan and it was something that I was getting ready to move out on 2008/2009 time frame. And that’s about the time Gabe and Lena Gordon at Seal Beach Beachwood in Seal Beach were getting ready to expand their restaurant enterprise. We had been friends for a number of years and we decided it would be better if we just joined forces and do a group up together. So I am writing about adjuncts in brewing, and in my own mind, I have always thought of adjuncts as a kind of a dirty word in brewing like Reinheitsgebot as well, just because they are used so much by the big three. Do you see adjuncts as a dirty word in brewing or is it something to have fun with? No, not at all, I brew with adjuncts all the time. It depends on where you set the boundaries for the definition of an adjunct. In general most people use it to mean anything other than barley, wheat or rye base products that go into the beer. For me I’d almost consider an adjunct anything that’s not barley malt, but that is my own definition of it. But I use adjuncts all the time, I use wheat, I use rye, both in malted form and in flaked form. I use triticale, which is a wheat rye hybrid. I use smelt, I use malted smelt which is an ancient wheat. We use corn in our foam top cream ale and I also use corn sugar all the time. I want to talk a little bit about your cream ale. I was looking at your web site and it says it was brewed with two row and German hops, and I was thinking there’s got to be some corn or something else in this, because I like these things and I know they are not all malt based. No, you can brew a Cream Ale with an all malt base, but personally I like having a little bit of that clean corn flavor in there. You know, there are corn like flavors that can develop in beer due to improper fermentation or boils that aren’t long enough and other sources. But, I like that, I personally like that clean corn flavor. We use roughly 5% in the total grist of Foam Top, it’s not much, but it’s enough to give the flavor. What advice would you give to anyone who said they wanted to use more adjuncts in their home brew? What would be the adjunct you would say to try out? Or how would you tell someone to go about using adjuncts? I don’t use any ingredient just for the sake of using them. Everything has a purpose in my beers, and typically when I design a recipe I think of flavor first. If I want to brew an Imperial Stout, what flavors do I want in that beer, what malts are going to get me there, what adjuncts are going to get me some of those background flavors in an Imperial Stout. Am I going to have to use a light brown sugar or dark brown sugar. Do I want to use lactose in there? I typically think of flavor first, every once and a while I will use something like rye to affect the mouth feel of the beer. I feel that that’s certainly another thing, that types of protein and the protein content in the types of adjunct grain is often different from barley, so you can create a beer that has alot of proteins in there to increase mouthfeel. But I guess my general advice would be first ask yourself why do you want to use this ingredient, is it for flavor? Is it for mouthfeel? It is for both? Is it just for the sake of experimentation, and there is nothing wrong with that. There are so many places to start, I don’t necessarily know it there is one place to start. You know what seem really popular with home brewers these days is rye IPAs. Yeah, I’ve noticed that Black IPAs and Rye IPAs have had this upcoming, at least in the brews I’ve seen come out. So maybe that is a good place for people to experiment. You could certainly do a Rye IPA with either malted rye or flaked rye, you would get different flavors. You could you use either, that would be a cool place to start. I would like to thank Julian Shrago again for taking the time to chat with me over the phone. And I hope that everyone makes a trip out to Beachwood BBQ and Brewing in Downtown to try a pint of his Foam Top Cream Ale. P.S. On a personal note, I am sure some of you have been wondering, “So this Al the Brewer guy, does he actually brew?” Well, yes, I do. While my living situation hasn’t lent itself to brewing over the past few months, I am now able to get back into full swing. 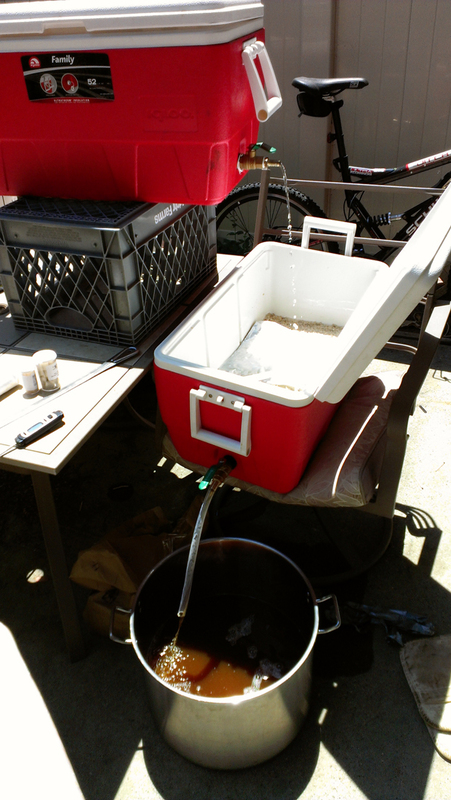 At the top of this article is a picture of my all grain system during my latest brew day making a Pale Ale. I will post my next brew as it comes.